Learn to how to create and manage a team on Challengermode. Alternatively you can navigate to the Profile dropdown menu in the top right corner and click on "My Teams". On the team overview, you can edit and add team information, like your official social media profiles, a presentation video, your country, description and more. 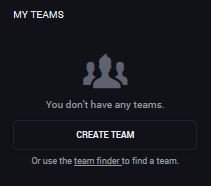 Your team(s) are listed in the right sidebar, regardless of whether you are the creator of the team or if you were invited. Clicking on any of your teams will open the Team Chat, where you and all the team members can chat together. A team can have up to 30 members, whereas a party can have up to 5.